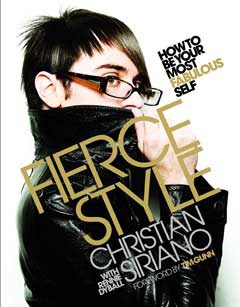 Stylish Book Review: Fierce Style by Christian Siriano | Fashion. Style. Beauty. | Life is short. Live well. Book cover courtesy of Hachette Book Group, Inc.
A few weeks ago in the midst of moving, a little package arrived at my new place with a book inside. It was Fierce Style: How to Be Your Most Fabulous Self by pint-sized fashion and style dynamo Christian Siriano. You’re familiar with Christian, I’m sure: winner of Project Runway, fashion darling, Payless accessories line and guest appearances on Ugly Betty. You’d think it was a book on being famous but no, although there are mentions of Siriano’s success in the book. Actually, it’s a cute, cheeky view of the world from Siriano’s lens; a guide on how to look, feel and live your most fabulous life. I know you’re thinking he’s in his twenties so what does he really know about life, and I offer that having read the book cover to cover (with a time lapse in between to grapple with the flu), there’s something in there for both the young and the old(er). Siriano’s philosophies on style, shopping, design and personal attitude/determination (which is really the most endearing section and a great read) are paired with heartfelt stories of his own disappointments and triumphs both personal and professional and it’s really quite inspiring. It also comes with a glossary of terms because the book is peppered with his favorite euphemisms such as “ferocia coutura” and “tick tack toe” (you need to read the book to see what I’m talking about.) With inset quotes from Vanessa Williams, Becki Newton, Whoopi Goldberg and Siriano’s Runway mentor Tim Gunn, it’s a quick-but-fun read that will make you smile and also give you some a little bit of insight into the design dynamo’s view on the world…and it’s really fun! A great gift for anyone just beginning to discover themselves and/or their own style, Fierce Style is a fun, fabulous read for the subway or for a great weekend wrapped on the couch with Project Runway re-runs. Recommended!